We Americans buy containers to hold stuff in the kitchen, the bathroom, the living rooms and bedrooms, and have containers to hold stuff in the car. We even have containers to hold our containers! And the stuff doesn't come cheap. The container and organizing business is a HUGE multi-BILLION-dollar industry! 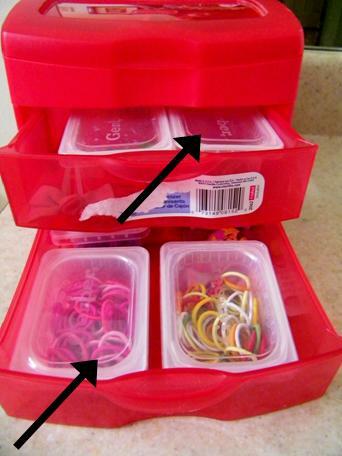 I love being organized, but I do not love purchasing all the little organizing containers at the store. They are just plastic boxes with price tags that no one will see! 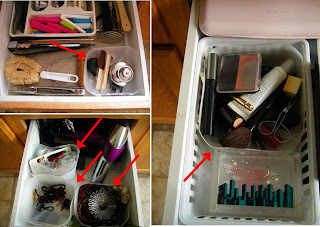 One day, it hit me that I had been throwing away containers that I had already paid for and were the size I needed to organize drawers. Here are some everyday containers I get in my groceries that I have re-purposed. I cut across to the height of whatever drawer I am using them. These are my favorite tools for organizing! I organize makeup, hair accessories, socks, kitchen gadgets, grocery trash bags. These last for years! But if they should ever get bent out of shape, they are easy to replace. Gerber's Stage 1 baby food containers were the perfect size to help organize my toddler's hair accessory drawers. 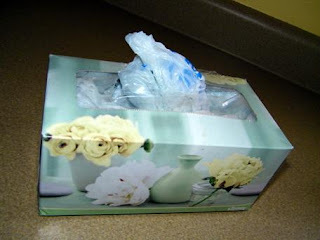 Mushrooms come in these sturdy plastic containers; I use them in several places in the house! Here, they are organizing baby bottle components, toddler sippy cup lids, and my round Pyrex lids. The girls each get their own big cups with which to dump themselves with water! 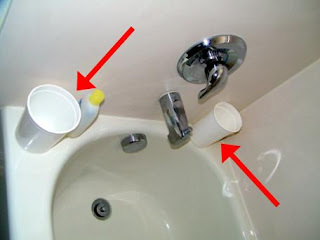 These big cups also come in handy when rinsing out the bathtubs after a good scrubbing. Shove grocery bags inside empty tissue boxes; keep a box wherever you need bags: kitchen, car, nursery (for stinky diapers). I mainly use shoe boxes as drawer separators. I am so happy about the ones in my undergarment drawers but thought it would be best to not post photos of those. What uses can you come up with for containers you already have?